Jabulile, a 13 year-old girl in a South-Afrikan township, is the star of her soccer team. One day, when she has shot a spectacular goal, a boy she has never seen before comes to congratulate her. He turns out to be one of the many refugees who have come from Simbabwe because of hunger and unemployment. His name is Romeo and Jabulile falls in love with him. 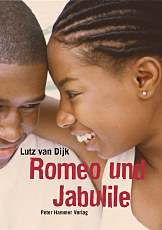 Since Jabulile’s brother and many others in her township are hostile to the refugees, Romeo lives in constant danger and the young lovers have to hide. A touching story about a young love and emerging xenophobia in South Africa.